Since this was first posted, I have added a photo. I love living on the edge–for me, that means challenging myself to make new things and never getting too comfortable. It’s not obvious to witnesses but, on some level, I must love the little rushes of adrenaline that come with the stress during those “What was I thinking?!? !” moments. For you real thrill seekers, this must sound pretty lame, but it doesn’t cost anything (except many sleepless nights). What’s she rambling about, you ask. Why, getting Bodyguard into the kiln, of course! On Sunday evening (October 11) my husband, Kevin, and I (mostly him, with my “encouragement” and plenty of nail biting–don’t you know he appreciated that!) loaded (I’d say “placed”, but “loaded” is more like it) Bodyguard into the kiln last night. She’s probably dry, but I am taking every precaution. My kiln is in what used to be a tool room off the garage (my old working space), about 100 feet from the new studio. The path is bumpy and Bodyguard is heavy. To get her there, we placed her in the back of our van. Kevin drove and I rode in the back with Bodyguard. Sorry, no photos, since we really needed to focus. I was a little nervous about whether we could get her into the kiln without damaging her. Since she’ll be traveling, I made her a little thick, so she’d be sturdy. However, until she’s fired, she would be very fragile. The piece has a lot of places to use as handles, but most would probably not support her weight at this stage. And she is tall enough (21 inches to the top of Chet’s ears, though she will shrink a bit during the firing) that it might be impossible to hold her from the bottom raise her to above waist height and lower her into the kiln. I measured a lot, to determine the maximum height of the kiln shelf so we wouldn’t have to lower her any more than necessary. We went through a few dry runs of how to pick her up, what to do if she needed to be maneuvered in mid air, etc. Kevin had worked in the garden much of the day, so didn’t really need one more physically demanding task, especially at 8:30PM, when we hadn’t had dinner. We placed a pedestal in the kiln room to have a place to set her down before the last lift (and in case we had to stop and regroup during the process). 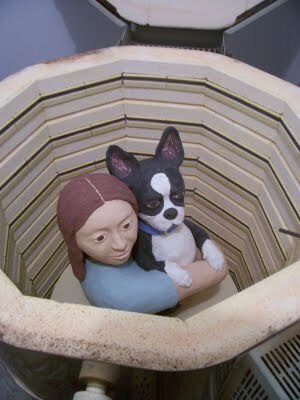 We took a deep breath and with almost no help from me, Kevin got her safely into the kiln. She’ll be at a toasty 150 degrees, sweating out every last bit of moisture in her dry sauna until I fire up the kiln. And she’s still smiling!